After skiing Lassen Peak the previous day (see TAY report), I drove back north towards Mount Shasta, unsure if the weather would cooperate the next day. Ominous clouds surrounded the mountain as I approached Shasta City around 6 PM, but as I sat and watched over the next few hours they thinned to a shapely lenticular uniting the summits of Shasta and Shastina. The lenticular had nearly vanished by the time I settled in to my car camp at Bunny Flat around sunset. A lot of snow had melted at the parking lot over the past 3 days, but it still looked possible to ski within 50 ft of the lot. The next morning dawned perfectly clear, and winds were nearly calm for the first time in 6 days I've spent on Shasta since Memorial Day weekend. It was a perfect day to ski the West Face, but I was quite tired and the forecast freezing level was only 11000 ft, so I decided to sleep in a couple more hours. Finally I got ready but as I prepared to skin up around 8 AM, who should arrive in the parking lot but two pickups with snowmobiles. They proceeded to unload the infernal machines and in a cloud of blue smoke drove straight across bare ground and shrubs and plants for hundreds of feet along the south side of the parking lot, right past some campers' tents, before reaching the pavement of Everitt Highway beyond the locked gate and heading towards Old Ski Bowl (a legal snowmobiling area). 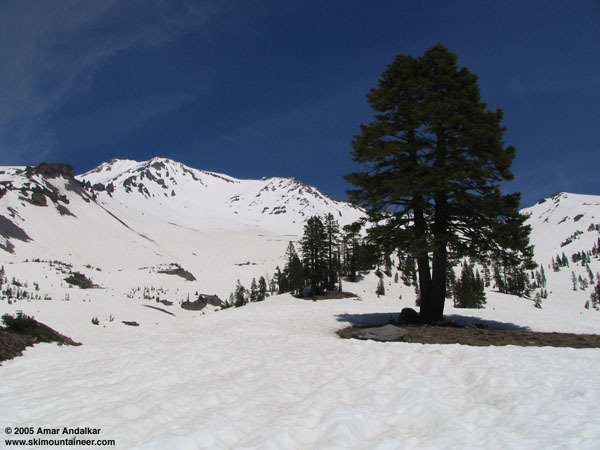 I was shocked and outraged, so I called the USFS ranger station and asked if California laws allowed them to drive across bare ground and vegetation to reach snow. They assured me that it was illegal, so I gave them descriptions and plate numbers for the pickups, and they said they would send someone up to take care of it. The ranger's last comment: "What a bunch of knuckleheads." I really hope they did come up and issue citations, but I never did find out. Anyway, not much else worthwhile to report. It was a Wednesday, and the mountain looked delightfully deserted compared to the weekend after I headed uphill at nearly 9 AM. The route to Horse Camp had a 50-foot bare patch at the edge of Bunny Flat, but I skinned across that and all the way to 11600 ft in Avy Gulch by 1 PM, with ski crampons helpful above 8500 ft (I was actually glad to get such a late start). Here the snow was still becoming steeper and firmer, so it was time to boot up the rest of the Gulch in crampons if I wanted to make the summit or even the top of the West Face. Or I could just ski down and enjoy 4700 vertical feet of excellent corn, followed the NW facing aspects of the SE gully as we had done 3 days earlier. Optimal snow conditions were right then, so I choose the latter option and had a quick fun run back to the car. A major winter-like storm system was forecast to arrive the next day, so I knew it was time to head back to Seattle. The storm did in fact arrive as forecast and dump over 20-30 inches of snow on Shasta, keeping the mountain primed for when I would return. Looking up Avalanche Gulch towards one of my long-time favorite trees, a majestic symmetrical twin Shasta red fir (Abies magnifica var. shastensis) near 7800 ft. Click here for an enlarged version of this photo.